Now that the dust has settled from the start of a new year, or even if it has not, it is time to go back to basics and see what you need to do to ensure your team’s leadership effectiveness. You are your direct reports’ most important coach, even if they have an external executive coach or a mentor. As such, you have the responsibility to ensure their growth and development. We recommend you set up a coaching plan for each person. If a direct report has an external coach, your role would be different from what is laid out here—but you should still have a role. Remember that direct reports’ perception or desires about what they should work on may differ from yours; this will require some dialogue. Examples of leadership behaviors a direct report might work on include: improve their coaching of their direct reports, become a better listener, build peer relationships, be more accessible, maintain composure under pressure, for example. We also recommend considering whether a 360 Leadership and Values Assessment might be the best way to identify development areas for each. While these coaching conversations can be sensitive, they are very important interactions with your employee. Before embarking on a coaching conversation, ask yourself, “What is the best way for me to prepare for this conversation?” For example, review the employee’s action plan, practice delivering the messages, make notes to refer to so you do not get off-track, discuss the upcoming meeting with your own coach or boss, go for a run, meditate…whatever works for you. The point is: be well-prepared. Keep the coaching feedback loop with direct reports going throughout the year. This is a business imperative, not a one-time event. In addition, think about team coaching (coaching your team as a team) as well as individual coaching, and link that coaching to your department’s strategic intention. There are two sides of the goal-setting equation, or there should be: the business goals and leadership behavior goals. The leader-coach should look at profit/results of direct reports as well as fit with culture (behaviors). 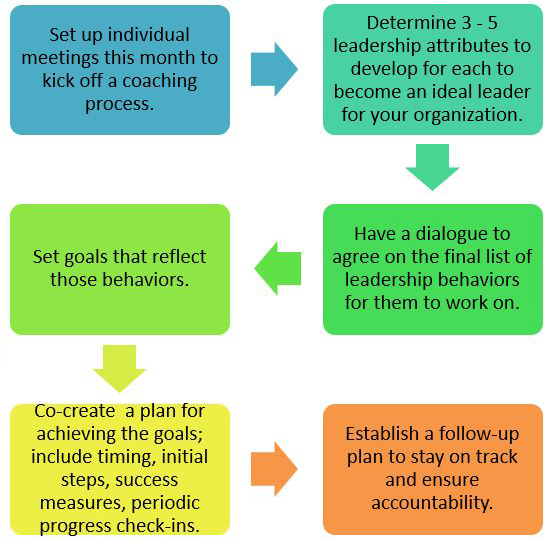 Do you have a process in place to coach your direct reports to improve their leadership attributes? What do you need to do to launch a coaching process for each of your direct reports?